It’s Saturday morning, and four Fredericton teenagers are at the last place you’d expect: school. They’re here on their own time, designing a drone attachment to collect water samples from Corbett Brook Marsh, a nearby DUC-recognized Wetland Centre of Excellence. If successful, this device will help them monitor water quality at the wetland without leaving an environmental footprint. “By not sending boats out to do water sampling we avoid gas leaks or cross contamination that can occur when you move a boat from one body of water to another,” says Will Marshall, one of the teens. “And we aren’t impacting the vegetation,” adds Nathan Hoyt, who joins Marshall as well as Brandyn Cook and David Nash on the project. These students are exceptional, but they’re not unique. 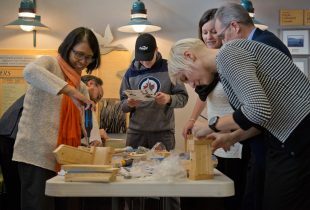 Stories of discovery and innovation like this one are taking flight at DUC Wetland Centres of Excellence (WCEs) across the country. 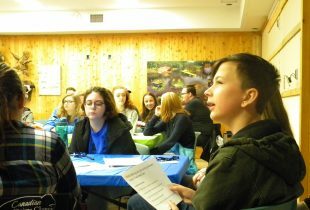 “The Wetland Centres of Excellence engage youth in wetland conservation through stewardship, mentoring of younger students, outreach in their local communities and environmentally conscious action projects,” says Merebeth Switzer, DUC’s national manager of education. Helping DUC invest in this next generation of conservationists is BMO Financial Group. Earlier this year, BMO signed on as DUC’s National Wetland Centre of Excellence sponsor. Over the next five years, Canada’s oldest financial institution will donate $300,000 to programs to educate and inspire tomorrow’s decision-makers. “The Wetland Centres of Excellence is a transformative and inspirational program that has already helped 100,000 young Canadians build a deep understanding of the importance of our environment. The Centres serve to foster invaluable leadership and collaboration skills. We’re excited to partner with Ducks Unlimited to help ensure even more young people can benefit from the program,” adds Ristich. Switzer is happy to have BMO helping foster this new flock of wetland heroes. “We’re overjoyed to have BMO join us in this effort,” she says. DUC earned its status as Canada’s leader in wetland conservation through its science-backed approach to wetland restoration, partnerships with landowners, and education programs. “At DUC, we’re committed to engaging with youth in rural and urban areas to show them how wetlands work. The fact that these ecosystems do things like clean our water while providing birds, insects and in some cases, fish, with a home amazes children. “The reason we dedicate so much to educating the next generation is straightforward: the future of our landscape is in their hands,” says Switzer. Back in Fredericton, the four friends build several prototypes to collect water samples. This innovative project has taught these students something valuable: the power of wetlands and of taking their education into their own hands. “I find it incredible how far we’ve come for a group of four regular high school students,” says Nash. And, who knows how far they might go? Planted over 196,837 trees and seedlings. Banded and provided records for over 70,000 birds. Planned and provided mentored wetland field trips and public tours to over 100,000 individuals.